Hello, friends! I’m excited to be heading to the Orlando area this week to be on a panel at the ILA conference. And I’ve also got two book events set up that are free and open to the public. Especially after Skyping with so many Florida classrooms this year, I can’t wait to meet young readers in Orlando and DeLand in person. Join us for our Summer Book Bash featuring an interactive, fun-filled afternoon with three amazing authors of books for young readers: Tara Dairman, Christina Farley, and Ammi-Joan Paquette. Activities, reading, Q&A and plenty of fun for young readers! Ideal for ages 9-15, open to the public. Proceeds benefit Orange County Library- Alafaya. Check out our Facebook event for more details! *Note: The fun kicks off at 1pm with local broadcaster and children’s book author Amy Sweezey; the middle-grade panel with me, Ammi-Joan, and Christina will begin at 2. Scholastic Fairs, new FAQ, & more! Greetings, friends! I have a few updates that I’d love to share with you. If you follow me on social media, then you might have noticed me celebrating an authorly milestone last week. All Four Stars has been picked up by the Scholastic Book Fair! Gladys and her adventures will now be accessible to a whole new slew of elementary-school readers. I was a huuuge book fair fan in my own childhood, and it’s a great honor to have one of my books included now. Also recently shared on social media: the cover for The Stars of Summer in Czech. I just love what Albatros and cover artist Eva Chupíková have done to bring Gladys (and her quest for NYC’s best hot dog) to life! If you’ve been poking around my website, you’ve probably noticed a few changes. 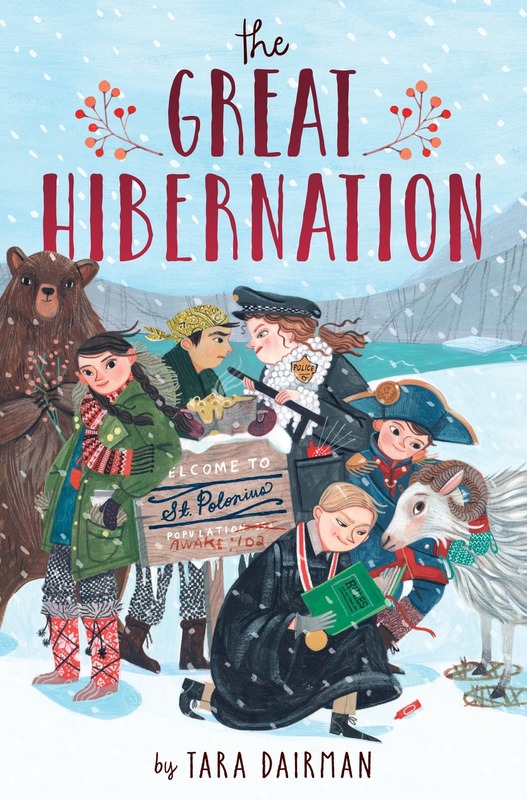 For one, The Great Hibernation is now featured on the Books page and the homepage, as well as in my new website header designed by the wonderful Kristin Rae. Greetings, friends. As the holiday season approaches, I am once again teaming up with Boulder Book Store to make it easy for you to order signed and personalized copies of my All Four Stars books! Personalizing is free of charge. To order, go to the Boulder Book Store website and choose the books you want. When you reach the checkout page, all the way at the bottom will be a field called “Order comments.” Just write in that field which book(s) you would like personalized, and to whom. Boulder Book Store will contact me, and I’ll pop into the store and personalize the books for you before they ship! You can also reach the store by phone to place an order at 303-447-2074. Signed books make great gifts, and I’m always happy to partner with this wonderful independent bookstore to provide them. Read deliciously this holiday season! But recently, a friend asked a different question: How did I get interested in “the food side of things”? Cooking, and eating adventurously, play a huge role in my books—and I bet a lot of readers assume that (like my foodie heroine, Gladys), I’ve been passionate about food since childhood. But they’d be wrong about that. I don’t talk about my “foodie awakening” as much as I should. But here goes. Though I wasn’t like Gladys as a kid, my parents were in some ways like her parents. They weren’t cooks. They didn’t own any cookbooks, or clip recipes from magazines. And neither of them had been taught to cook when they were younger. It was a skill that had, between generations, slipped out of use in our family. As a result, the kitchen was like a foreign country to them—and a kind of scary one. Sharp knives could cut you! The stove burned! They didn’t have experience using these tools, so they only saw the dangers. The microwave seemed safe enough, so they cooked pretty much anything they could in it (and some things that you probably shouldn’t). And when our freezer ran low on microwaveable meals, we ate cereal or got takeout. So perhaps not surprisingly, I was not an adventurous eater when I was a kid. (I was a lot more like Parm in my books than like Gladys!) I hadn’t been exposed to a wide range of good-tasting food, so I didn’t like much of it. Finally, in high school, I started trying new cuisines, thanks to a club advisor who made it his mission to blow our minds with Indian, Ethiopian, Malaysian, and Japanese food. But it wasn’t until much later—when I was a college student, on the verge of living on my own—that I took a hard look at my future as an eater. I could go the way of my parents, relying on frozen-meal companies and fast-food joints to feed me for the rest of my life, or I could roll up my sleeves and learn how to cook. I bought a copy of Mark Bittman’s How To Cook Everything, asked for a food processor for my birthday, and never looked back. Those first days of cooking, on break from school at my parents’ house, were slow and a little painful—especially when I’d promised everyone dinner at 7, only to get it on the table at 9. But with practice, I grew more confident, and the results grew more delicious. My parents may not have cooked much for me, but they let me cook for them, and soon we were sitting around the table together, enjoying a homemade meal. I had turned a pile of raw ingredients into something nourishing for the people I loved—and I was truly shocked at how powerful that made me feel. So, that’s my story about “the food side of things.” I kept enjoying new cuisines and making food for others. I finally got brave enough to attempt my dream of writing a novel, and I wanted to make my newfound passion for food a part of it. When I got the idea to write about a young girl whose parents ban her from the kitchen after a cooking mishap—a girl whose dream is to become a restaurant critic—I knew I’d struck gold. When I meet readers today, some tell me that my books have nudged them to try a recipe out for themselves. It’s not often that we fiction writers get to hear about our stories affecting people’s real lives. But knowing that Gladys’s foodie adventures have inspired kids to develop a skill that I know will serve them—and others around them—for the rest of their days…well, I can’t help but weep salty little tears of happiness. Saturday, December 3, is #FCSDay, when tens of thousands of people commit to “dining in” with family and friends. To celebrate, the American Association of Family & Consumer Sciences (AAFCS)—with support from my publisher, Penguin—will be giving away several sets of the All Four Stars trilogy to participants as prizes. To learn more and sign up to “Dine In,” visit aafcs.org/FCSDay, and follow the #FCSDay and #healthyfamselfie hashtags on social media. Yes, the Stars So Sweet blog tour is wrapping up, and today I’m at Jennifer Chambliss Bertman’s blog, showing everyone where the writing magic (and, um, laundry) happens in my Creative Spaces interview. This is also your last chance to win a full set of the All Four Stars series! Though the virtual tour is ending, my real-life tour rolls on–I’ll be in Cedarhurst, NY today, Larchmont, NY tomorrow, and Colorado next week! Check out my events page for the details. 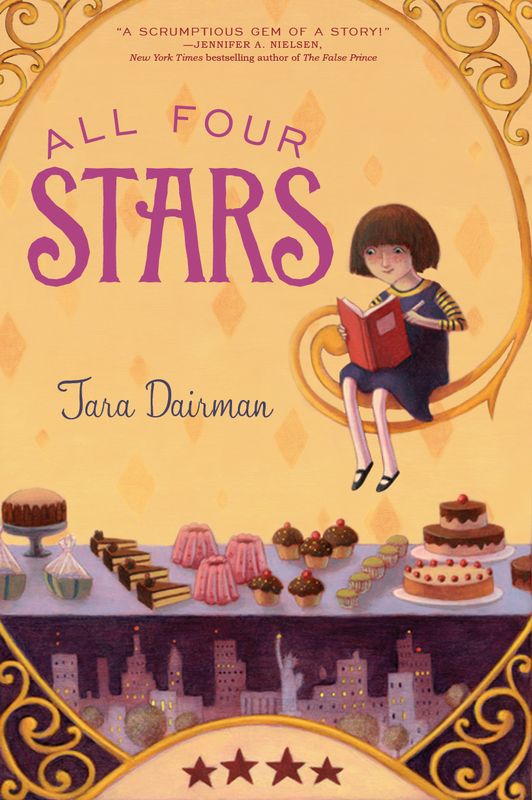 Blog tour stop #4: Book blogger and school librarian extraordinaire Katie has been a huge supporter of the All Four Stars books since day one, and I was even lucky enough to meet her in person last spring at one of my events for The Stars of Summer! 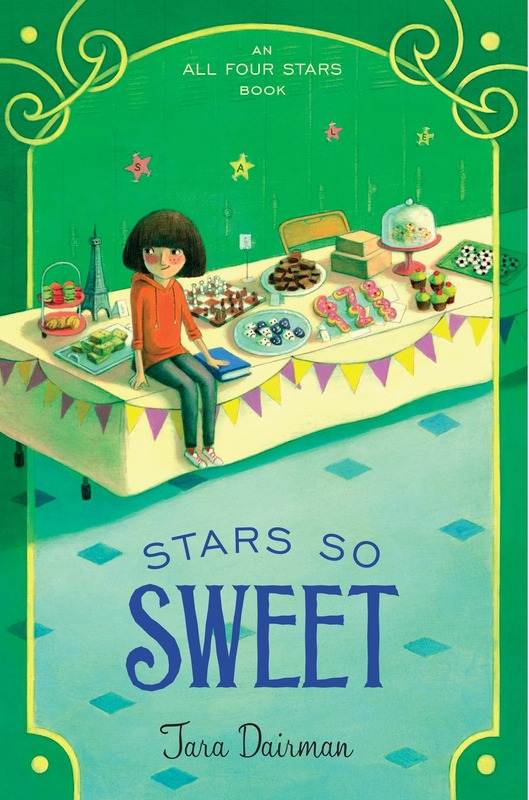 Stars So Sweet comes out ONE WEEK from today, and if you’re in New York, I hope to see you at my launch party at Books of Wonder. Please check out all of my upcoming events here (with a couple of new additions and updates! ).